Time and time again, it’s been shown that a little bit of hope can make a world of difference. 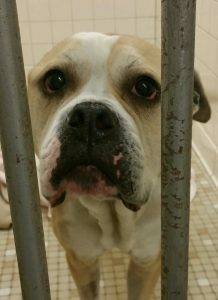 An American Bulldog mix was brought in as a stray to the Humane Society of Macomb Animal Shelter on May 10, 2016. She was very thin, and obviously very ill. She was rushed to the Humane Society of Macomb Animal Clinic, where she was immediately placed on intravenous fluids and had blood drawn for extensive testing. Once the results were in, the doctor diagnosed her with a condition called pyometra. Pyometra affects only intact female dogs and cats, and can be life-threatening. Pyometra is caused by an infection in the uterus, which leads to the development of pus. As the pus continues to be produced, the uterus swells. The infection can cause the animal to feel so ill they lose all interest in food, which is likely the reason the American Bulldog was so underweight. As the infection worsens, the affected pet can become septic, which is a serious, sometimes fatal, systemic infection. 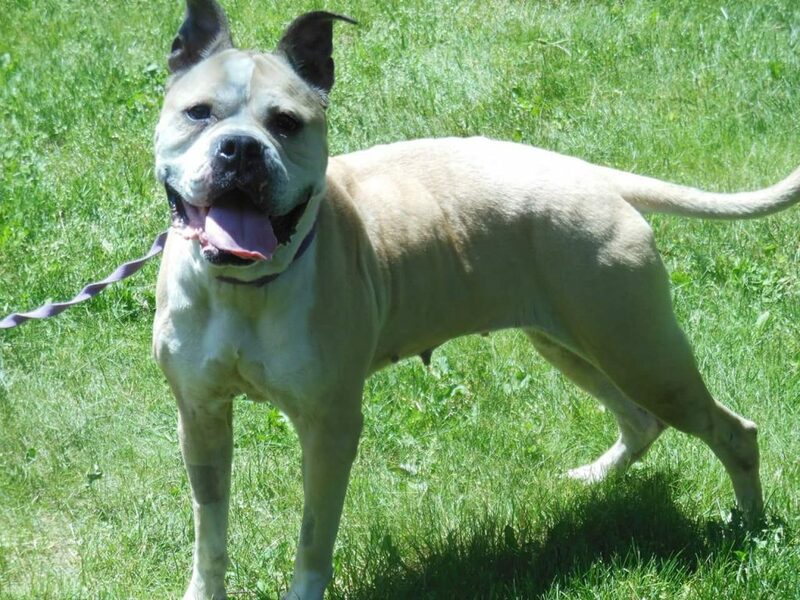 In the American Bulldog’s case, the infection had become so severe that many of her blood values adversely affected, adding to the urgency of addressing her illness. The decision to surgically remove the dog’s uterus was made, and she was rushed into surgery. Once removed, the uterus weighed 7 pounds! This would be the equivalent of a 20-pound uterus in a human female. Over the next 4 days, Hope continued to receive intravenous fluids, antibiotics, pain medications, and of course, lots of love, support and encouragement from the staff at the clinic and shelter. Hope fought hard, and after many days of care, her bloodwork showed a marked improvement, and it was clear Hope was going to be alright. Once she was placed up for adoption, Hope waited patiently for the right person to come along. It took a month, but Hope finally found her forever home with the person who originally brought her in to the shelter! Getting puppies and kittens spayed as soon as they are old enough to have surgery completely eliminates the risk of pyometra. But spaying isn’t rese rved for puppies and kittens – it is never too late to have animals spayed, as long as the pet’s doctor feels the pet is healthy enough to undergo surgery. Hope is a great reminder that even in times of severe illness, animals can have immense inner strength. She also is a great reminder that having dogs and cats spayed is one more way of making sure your pet has a happy, healthy life. UPDATE: We are happy to say that Hope was available for adoption on May 27, 2016 and was adopted on June 25, 2016.